Home/Roger Federer/Is @RogerFederer Testing a New Racquet? Is @RogerFederer Testing a New Racquet? 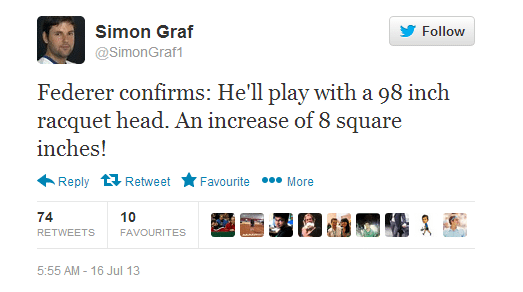 Update: It's confirmed Federer is using a 98 square inch racquet head in Hamburg. I guess it could also be an original Pro Staff as it does look quite similar. I know many of you have been advocating a change in Fed's equipment for some time so you will no doubt be pleased if he is indeed using a new racquet and has moved to a bigger head size. So it should be interesting to see what he steps on court with next week for his second round match against Brands or Lorenzi. Allez! Yeah interested to see if it actually is a new racquet. Just a crap quality photo at the minute is all we have to go on. I’ve always wondered if Fed would move into a lighter racquet with more forgiveness and a slightly bigger sweet spot like the Pro Staff 95, as he continues to age. No idea what racquet he’s holding in his hand though, but I doubt he’d just pick up a racquet to strike a pose! If it is a new racquet, I hope it’ll bring him another slam in August/September :). Yeah hard to tell from such a poor picture! Definitely different though whatever he is holding. Hard to say whether it’s bigger frame though. Interesting, what reasons do you think it would be too big a change? I’m pretty sure he has realized that his equipment is debilitating his performance. Also, I agree with Jerry above that going to 95 will be too big a change. Ahhh come onnnnn Sid, you’ve been wanting Roger to change racquets and it looks as if he might be doing so after all and you’re not happy? No, I’m happy. It’s just a question of 95 or 93. I am saying 95 may be too big. No way is it going to be larger than 95 though. But he might stump us all by simply going for a much head heavy 90 sq in. Maybe 5 points head light. I agree that a 95 would be a big change, I just chose the next head size up from 90 inches offered by their product line. However, it is Roger, so if he asks to try a 93, I’m sure they’ll custom make it for him! Anzhit, the Blade 93 is in no way similar to Roger’s racquet. Did you mean in comparison to the Pro Staff 90 or the one in the picture? Interesting, 90 to 95 seems logical to me. But it looks like a Blade 93 although with 16 x 19. Why do you think the jump is too big to 95? You’re right. The Blade 93 is 18×20 but maybe the one in the picture has been modified? Maybe it’s a Blade 93? Ha! That would be funny because I was testing it for nearly a month. Could be, but string pattern on the retail blade 93 is 18 x 20. No way Fed would go for that. Either its a blade 93 or just an old prostaff. Jeez! Why would he go back to an old Pro Staff? No way he is going to an 85 inch racquet. Would be suicidal. i meant maybe he just picked it up for a little hit. I agree, I just added a video, it could be a 98 for sure. Maybe it’s just the same racket without the usual paint job. Let’s hope for a larger frame. Well that’s new. Can imagine if Fed is trolling us all though lol. Would he be ready to play with it if it is indeed what we all think it is in matches though? Anyway, can anyone believe Toni Nadal admitted he coaches Nadal on court (ok we already knew this) but said he is coming clean because he has nothing to hide. This guy takes the cake. Yeah Uncle Phoni Mafioso owning up to on court coaching lol. DId you see Russell’s facebook update about Hewitt? lol. Said it was his publicist. I have a pro-staff. That’s not a prostaff. What he’s using has an aerodynamic cross-section. The pro-staff has a box cross-section. The second picture looks morel like a 93 than a 98. Yeah I agree man, definitely not a Pro Staff 85. The throat on the racquet is different from the pro staff, pro staff also has pws on sides whilst racquet in photo does not! Head seems larger than 90, so may be a customised blade especially made for roger! Blade is exceptionally manoeuvrable but nothing beats feel of the pro staff 90. I play with both. I did wonder whether he would be prepared to use it in matches yet, though. But I suppose he’d have to do it sometime, and well away from something important like a GS would be a good time. I wonder who took it? Guessing one of his team. Interested to see what he decides to use vs. Brands. Hmm not a fan at first glance. That picture has that racquet in it again. Maybe it’s the Old Pro Staff 95? That’s exactly what it looks like. Check the video I just put up, head size looks pretty big to me. Could be 98 which is quite crazy. I agree Simon. That polo looks much better on than it does on its own. 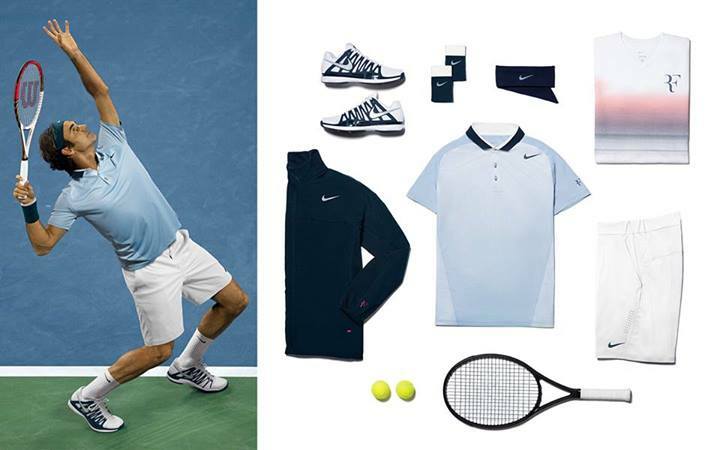 I know many here weren’t fans of the Madrid or Rome masters outfit that Roger wore, but I thought it looked much better all together than as separate items as well. I’ve seen lots of websites listing Federer’s 2014 AO outfits, but was wondering if anyone had pictures. Though from what I understand, pictures are not allowed to publicly shared on the Internet until Nike releases them? Guess I’ll have to go to my local tennis shop and ask to see the 2014 Pre-Spring catalogue from the owner! Looks like the Blade 98, 16×19 version. It indeed looks like a pretty big head. It will be interesting to see whether he actually uses it during his matches or not. My guess, he will. He may have added these extra tourneys just to test the new racquets as he has nothing to lose (atp point-wise) here. I don’t think there is a Wilson Blade 95. I’ve tried both the 93 and 98 recently so I know. It can’t be a Blade 93 because that one has an 18×20 string pattern. And it simply cannot be a 98, no way, no how! So, what is it? A modified 93? Or an old Pro Staff 95? Again, who knows? Though racquets with those specifications (I think the one in the video is of 16×19 string pattern) may not be available in the market, they may have been custom made for our king Fed only. Thanks for sharing that video Jiten. I agree with you it could be a 98 looking at it, it looks noticeably larger than a 90 or 93 but are my eyes playing tricks on me? I don’t think your eyes are playing trick Jonathan. I see the same thing here. Yes it is a HUGE jump from 90 to 98. If he starts winning with this, probably we will start clamoring: “OMG, he has been missing the trick all along”. The GOAT is full of surprises! Jonathan, whoever said that has no idea what he is talking about 🙂 Yeah, Roger’s a GOATful of surprises! He just confirmed he’s upping the head size to 98 sq.in. Together with the string pattern, that leads us to: Blade 98, 16×19! I Told you guys! Confirmed, wonder what the new racquet is! Very true, although the theory certainly makes sense and the pictures support it ;). Roger hasn’t played these tournaments in years and I doubt it’s because he badly needs a couple tournament wins to get his confidence up (what some others seem to believe). I could see him testing the new racquets but still using his Pro Staff 90 out of comfort. It takes some time to get used to a new racquet, especially with how demanding tour players are from them and at the levels they play at. 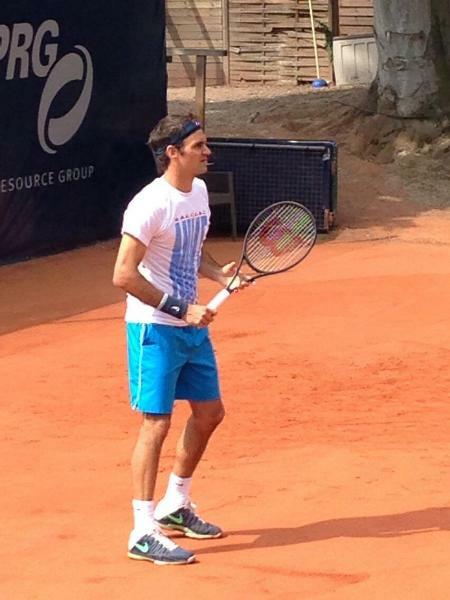 It was confirmed on twitter by TennisConnected that Roger was playing in Hamburg and Gstaad to test a new racquet! Will be interesting if it can bring the desired results and to see which one he ends up using. Ah! Now it makes sense. But is there any way we can know the exact racquet he is using? Sid, if I could give you the answer to that question, I certainly would! I don’t care which one he ends up using, so long as he wins another slam or two ;). According to Matt Cronin on twitter fed is testing a new racket and thats why its all blacked out. Maybe its some type of prototype and the rackets name and or paint job arent decided yet seems quite possible to me Wilson must have a made a custom made stick for fed . He’s practicing with it so much pretty much tells us that he will surely use it in hamburg and in gstaad too . If it is a new model (and not just a new paint job), and around 98 sq inch, then i am worried about the serve. Correct me if i’m wrong but wouldn’t the bigger head hamper the Roger serve??? 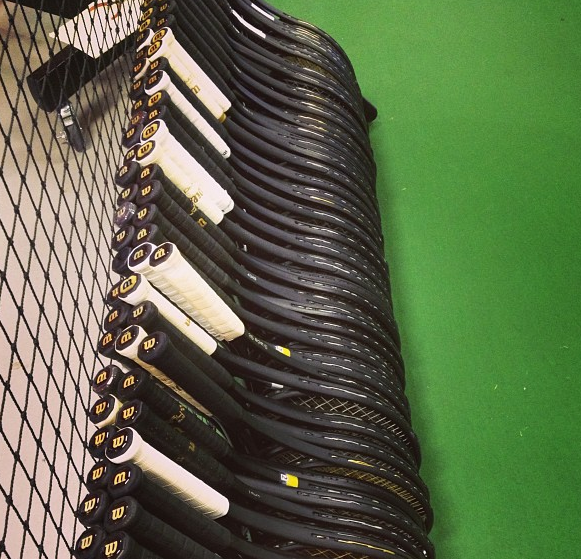 I’m not an expert on racquets, but I think it depends on how the racquet is shaped too. My friend uses a Dunlop 102 square inch racquet and visually, it appears to be smaller than my 100 sq inch racquet due to its oval shape. I have my doubts that he’d make such a drastic change from 90 to 98, but if the racquet is shaped in a way that elongates the racquet, I think it helps with the serve since it would give you a larger margin for error when hitting the ball at the optimal height. 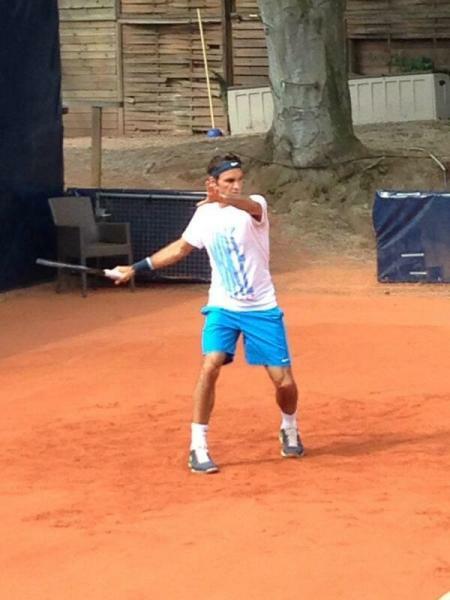 Hey guys, just saw a pix of him with his usual racket in Hamburg…. Federer confirms: He’ll play with a 98 inch racquet head. An increase of 8 square inches! Wow, that’s massive. Good or bad thing? By the looks of it…good. Maneuverability…how will he handle that. The things that are possible with a smaller head size, that make Roger Federer so unique, will we continue seeing that? I guess he decided to go in with all his chips. This seriously levels the playing field. He can do massive damage man…if he can use it well. Big jump, but we know the GOAT doesn’t take half measures. All or nothing. Allez! I think it’s a good thing, but of course we need to see him play! I figure he has more margin for error on a lot of shots, sacrifices some control and power but he can string at a lower tension to compensate. Sacrifice power? I think this racquet actually will give him more power in that he can actually take bigger cuts at the ball. I’d have to agree with Sid, I think the only thing sacrificed will be Fed’s control. Might see less of Fed hitting the corners and shots down the line, but being better equipped to neutralize the aggressive baseline hitters like Murray, Djokovic and Nadal. One thing I’ve always loved about Roger was his uniqueness and ability to win points in a variety of ways, as well as not being dependent on sitting back and counterpunching like the other top 3. Hopefully, not too much control is lost and only more is gained in his overall game – Roger winning again is probably the most important for him, but I hope the beauty in his game is not lost with the change. I guess he will get more pop on defensive type shots. But a full blooded forehand where he’s set on his feet and taking a full swing surely Pro Staff is more powerful? Jonathan, it depends on how he sets up or has set up the Blade. It is 1 point head light. Compare that to the Pro Staff which is 8 points head light. The Blade is only 11.2 oz strung compared to the Pro Staff which I think is 12.3. So, that’s nearly 30 grams. The racquet and ball will fly. That’s why I didn’t believe that he will move to the 98. But, if he has brought the weight and balance closer to the Pro Staff, then the control will be back and forgiveness with the sweet spot would be the main advantage. Which means much better defense. And of course, he can actually swing much more freely when he is not threading the needle, as Christopher mentioned above. Christopher, to your point, that you hope that the beauty of his game is not lost: I agree. I am a huge fan of Roger Federer not because of his slam and the multitude of other records, but because of how he plays. As Sid pointed out above, I doubt Fed will lose any power. The bigger head size will give him a larger sweet spot and greater margin for error, also allowing him to have more power in a more effortless swing. However, controlling this newfound power may prove difficult to adjust to, especially if the weights are not properly adjusted to compensate for the sudden change in racquets. The greatest benefit should come from Fed’s backhand defense. Opponents like to key in on it and the new racquet should give him extra pop to allow him to ease back into controlling rallies. My concern would be with precision and whether or not he can maintain his control on his devastating inside-out and inside-in forehands; two of Fed’s most dangerous weapons and best shots ever in tennis in general. Agreed Sid. I would love to see Fed win at least two more slams, let’s hope this racquet change allows him to hit with more power and spin, as well as maintain the variety and beauty in his game :)! Adding to what Christopher said, more mph on the serve would mean the ball will come back much faster. So, Roger as to be prepared for that. Same goes with quick ground strokes, the faster he hits, the sooner the ball will arrive. I doubt he will compensate by giving up the baseline. The backhand I think was what it was all about. Particularly against Nadal. So much more forgiveness to massage the ball, and impart more swing speed. No more dabbing around. The inside in and out are shots that require so much maneuverability and Roger may suffer there for some time. I’m worried about the front court game and how he handles those dipping ball or low slices. 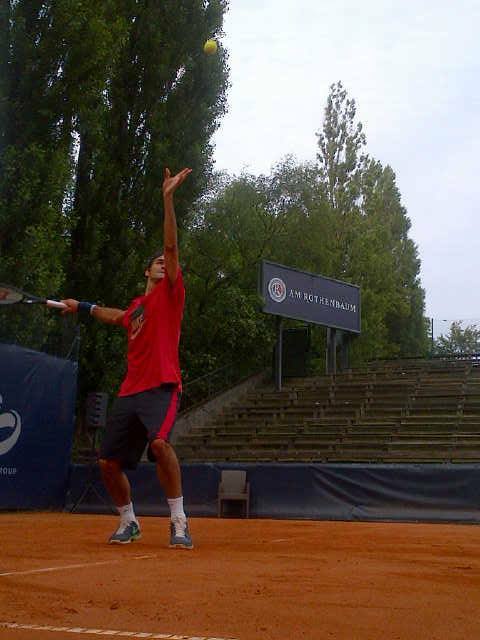 In the clip below, Roger practices some volleys and general net play during practice for Hamburg. Granted, it’s not a real match and the ball will likely come at him much faster, but he seems to have maintained his net play with the bigger head. You’re right. I think he is GOAT enough to be able to wield that racquet. I still can’t believe this is happening. Bigger serve. Better returning. Increased offense. Better defense. Am I dreaming? Are we going to see those great results? Definitely. I can’t wait to see him live at the US Open, hopefully the new racquet will be carrying some momentum by then :). that larger and liighter rackett will actualy give him more power on fool blooded forehands but he will lose out on control. He will need to adjust a lot to hit it accurately on the lines. And i agree the way he sets up his frane with weights will also make a big difference. His backhand flicks will surely not be breathtaking anymore as maneuverability will be sacrificed. But all those are low percentage shots. His defence will improve so will his backhand which are parts of his game which are being tested and broken down more frequently nowdays. This could be a big turning point. Anzhit, I’m pretty sure Roger will have brought the weight of that 98 close to his Pro Staff, and also the balance. He simply can’t be hitting with an 11.2 oz and 1 pt head light racquet. If he can bring the weight and balance to where he desires, those sick backhands will actually get better. Christopher, I’m not worried about the next two or three events. I’m excited about the US Open. You’re absolutely ******* kidding me! Knew it was a Blade but a 98? That racquet is very powerful. Not just the size, but the balance. I’ve played with that against a huge hitter and it makes life so much easier. Service, return, ground strokes…but not so good on volleys and digging the ball out. He must have surely modified it to add weight and make it more head light otherwise there is no way he can wield it. Folks, if he can handle it, hell will be unleashed. So happy he has finally made the change! 98!!! Either Blade or Steam! Huge power!! Just hope he doesn’t lose his touch! Right decision as hasn’t been on level field for a while!!! Watch this space for titles people!!! I don’t think he will Susie. Like I said below, one player who I think has decent touch and racquet head control is Murray, his racquet is 98sq” too and isn’t hampering him. Managed to turn his forehand into a weapon too so I’m excited to see how it improves the GOAT. I have put the following racquets on sale. Interested parties, please let me know. Holy crap, 98? That’s a HUGE increase. This definitely confirms why he is playing Hamburg and Gstaad- more matches and also to test this baby out. This is going to be interesting- I the rest of the season is going to be a good one! This should also silence the joke fans who said this was a retirement tour. Lol the opposite quite really- he is trying to reinvent himself. Hopefully it pays of and we can get back to our winning ways. Looking forward to what happens from here. Allez! I think the loss of control and feel is going to be marginal. Small sacrifice compared to the gains it brings. Tbh, the one guy who I think has quite a lot of versatility, control, good slice and good volleyer is Murray. He’s using a 98sq” with no problems. Didn’t he change his 85sq racket to 90sq in 2002 just before Hamburg and win the title? This is interesting! You right because at Wimbledon 2001 vs. Pete, they were both using the Pro Staff 85. Then in 2002, he did switch to a 90 sq on. Yeah he was using 85sq” back then. It’s been confirmed that it ISN’T the Blade 98, but the frame is 98 sq inches. It’s a prototype that Wilson have developed with Roger. Makes sense. They must’ve built it similar or close to the Pro Staff 90. Do you have the exact specifications? Cool, where did you see that? I expected it to be a custom job anyway, but based on the Blade 98. With this sort of change, does anyone expect Roger to win this week now? He is in uncharted waters, right? My expectations are very low. If he wins, it would be a huge sign of things to come. I’m with you Sid, will be very surprised if Roger wins the title this week, let alone make the final. I think he will go for the kill in Gstaad though. Well well well, The Great Uncle Toni finally admitted in a Spanish article that he does give Rafa on court coaching in Spanish….. and he is not even ashamed about it. Some people I say…..
Hi guys and girls, I have something to say…. You know, I am in my “Roger mood”, so please pay attention to what I write (even if it is nonsense) !!! I am so proud of Roger. He is indeed a very very stubborn man, but also a ‘slow yet quick learner’. He did not want to play with a bigger racket. In his mind, why should he? He won 17 GS and 77 titles without a bigger racket, so why should he?? Personally I don’t know if I agree. On one hand I think he should have started practising and playing with a bigger racket at the beginning of 2011 when he was losing a lot, but on the other hand he should not have, because with his smaller racket he did started winning at the end of 2011 and eventually had 2012 and went even back for four months to world number one !!! But I do think he should have started practising (or playing with both the smaller and bigger rackets) in 2013 when he started to lose a lot. But the reason why I am so proud of this stubborn man is that since his losses in 2013 everybody (yes, including fans) started to write him off. Which became worse after his RG and Wimby defeat. They even thought he was doing a farewell tour. But… Roger is showing what he has always said himself, that he is a student of the game and that he wants to learn and improve. And that he is not too old to learn. The Wimby loss was indeed a wake up call (hopefully with the same effect as USO 2011). He really learned that although he has played good in 2013, others are better. And to beat them, he has no choice than to use a bigger racket. I am so impressed and relieved. Finally, he has seen it himself and he is willing to change something. And what better way to start at these tours than right away at a 1000 tour of USO. I think this will be good for him. But to be honest, I don’t have a good feeling about 2013. I cannot see him win a lot or USO. OF COURSE I WOULD LOVE TO BE WRONG !!! But I think he will use 2013 from now on to get better and used to a bigger racket with weight(?). And 2014 he will rock. I really think so. He might do well in 2013, but 2014 will be Roger (accustimed to the bigger racket) and going one more time for world number one. “Roger-Slam” (or the possibility, like the almost Serena-Slam or the almost Novak-Slam) !!! Mark my words people, Roger finally (yes finally) got the wake up call that HE needs to change. And you know, the man is still not talking about retirement, so I can see him not only winning a lot, but also playing till his fourties. You know why I am thinking this?? In a week time I have watched four times the Wimby Final 2012 from the second set 5-5 till the end ceremony. Roger before the second set 5-5 was outplayed by Andy, beeing jerked around by Andy, beeing seriously bossed around by the unbeatable Andy. Until second set 5-5 till the end. That was the Roger show. Goat. Magician. Unplayable Roger, where even during the longest game (that Roger broke) I felt sorry for Andy. Now that is Roger with his usual racket. Now he has a bigger one. Don’t know what will happen in 2013, I am to be honest not that hopefull, but 2014 will rock. Roger with a bigger racket. (Of course untill the other ones decide to play with a 115 racket or something, but lets not go there… yet). I also think Roger has listened very good to his hero Pete when he said he wished he used a bigger racket at the end of his career. You know guys… I am writing all of this and Roger has not even played his match today. Would I not look a fool writing all this and Roger losing today??? Come on Roger, don’t make me look like a fool. You finally changed something (even somthing as small as your racket). So hope for good times with Roger and a bigger racket. I know long comment, but hey, it is me you know…. Ps: Don’t laugh about the possibility of a “Roger-Slam”. Could happen you know !!! No worries, he’ll win today! Hey Wanda, Goat of Roger fan…. hmmm, I like that !!! But aren’t we all on this site Roger’s personal goats??? Unfortunately I cannot watch the match. I am still working so…. hope the bigger racket does the trick for him…. I think Roger is going to have a great second half of the season like in 2011, which should give him momentum for 2014 as well where he could make another run to number 1 because wow he doesn’t really have any points to defend other than Australia. Take it one tournament at a time Katyani! First thing first, lets see how Roger adapts to this new racquet of his in Hamburg and take it from there. Hey Alysha, just like you all I have also lowered my expectations. No more sure of Finals, SF or even QF. Lets take it one match at the time, one point at the time and he will be holding the trophy !!! But great that he defeated Brands….. looking forward to tomorrow…. Wow, are you doing anything tomorrow night? Woo! Almost time to see Roger play with the new racquet, can’t wait! A lot of aces so far, net play looks good. He’s definitely not fully used to the power yet, he’s been ripping some shots long. Yeah. rustsy and some errors but a win is all that matters. I can’t watch the match. How is roger playing? Serve was great for his first two service games, then struggled a bit on the third and really fell apart on the fourth. When he’s serving well as he did on the first game of the second set, he’s hitting the corners and acing Brands. His returns are average right now, definitely not the same as we’re used to seeing as he’s hit quite a few into the net. The biggest concern is the easy shots he’s missing. Several times where he’s pulled Brands off the court only to send a shot into the net or a backhand way out. He’s cruising now. Not sure if it’s because he’s become more comfortable with the racquet, Brands tiring or the mental factor of Fed taking over. Thanks for the updates Christopher. I also cannot watch the match. Will have to see highlights to see how he’s hitting the ball I guess. The good news is that he was at deuce several times on Brands’ serve, but unfortunately lost two break points when he was up. Yeah, I thought it was a good match, Brands is good. Phew, I can breathe again. Didn’t see it, but was watching the scores change. Seemed like he started to get more momentum in the second set. Look forward to hearing the synopsis & how his ground-strokes were. When he let rip on his forehands, did they look any more powerful than before? I’d say his overall game was fairly hit or miss. When he really connected with his forehand, I felt there was more power than in the past (especially when you consider the shots were on clay!). However, he definitely struggled a bit with controlling the power and sent a few forehands into the net and numerous backhands way out. Hopefully, once he harnesses the newfound power, he’ll be able to have a more consistent showing. His serve wasn’t completely on today, but the second serve seemed to have a bit more pop and spin than usual. It was nice to see Fed continuing to mix it up and not rely on a power baseline game (as the racquet switch may give him the complacency to do so), as well as continuing to attack the net on occasion. my only impressions about the racket change were that he seemed indeed to have cleaner and more powerful spinned backhands, and that his serve “flew” more than usually. It was in fact just about an hour and a half. Most points were won pretty quickly, but there were definitely some entertaining exchanges with some outstanding volleys, drop shots, finesse touches, overheads and winners by both. Crazy match time! So much better though when they just get on with it.